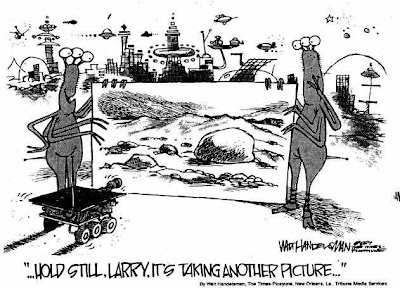 The Curiosity landing on Mars this week is a good reminder of how close science and science fiction often are. The technology used to get the rover on the surface of the planet is nothing short of amazing, and the images coming back from Mars are sure to inspire the next generation of sci-fi authors. Olympics plus space rovers--what could be better? Well, there might be one thing. Look who Curiosity found on Mars! What are your favorite pictures, links, images, etc. from the Curiosity landing? Let us know in the comments!